Emergency services were called to Dalry, at around 9.25pm on Saturday. A teenager has been charged in connection with the death of a 25-year-old man in Ayrshire. 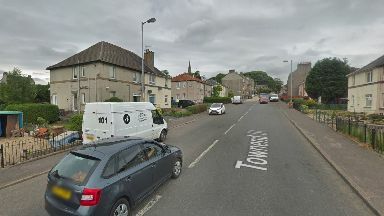 Emergency services were called to Townend Street, Dalry, at around 9.25pm on Saturday after the victim was found seriously injured. Paramedics battled to save the man's life, however he died at the scene. A 19-year-old man was arrested and charged in connection with the death and will appear at Kilmarnock Sheriff Court on Monday. A Police Scotland spokeswoman told STV News: "At 9.25pm on Saturday, police were called to a report of a 25-year-old man having been seriously injured in Townend Street, Dalry. "Emergency services attended, however the man died at the scene. "A 19-year-old man has been arrested and charged in connection with the death and is due to appear at Kilmarnock Sheriff Court on Monday.